Disan central vacuum systems thoroughly and permanently remove dust and dirt particles from your living space. Other cleaning machines often only remove part of it, leaving dust to settle on the furniture. Disan helps to improve your quality of life. Disan central vacuum systems have up to a 70% higher suction power than conventional vacuum cleaners. There is, therefore, no need to vacuum more than once over any surface. This saves you time and money. The Disan central power units are normally mounted in the cellar, garage or storage cupboard. The distance from the motor means that you will have no problem hearing even the doorbell or the telephone ring. Pets, babies and other family members will no longer be disturbed or woken by the sound of vacuuming. Disan central vacuum systems help to get rid of harmful dust particle matter and bacteria by removing them completely from the living space. Conventional vacuum cleaners with filter systems, on the other hand, exhaust some dust back into the room. 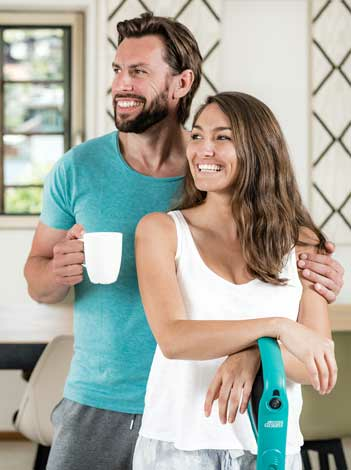 Studies have shown that Disan central vacuum systems improve the air quality of rooms and are, therefore, ideal for people that are allergic to household dust. 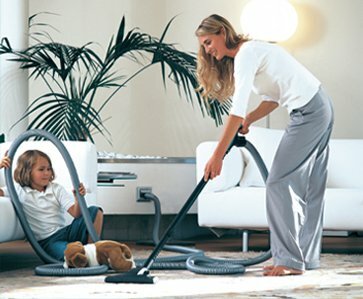 Disan central vacuum systems make vacuuming undeniably easier. The painstaking pushing, pulling, carrying and the emptying of bags or containers is no longer necessary. Our in-wall vacuums have a practical central vacuum hose that can be easily inserted into the wall inlets. The central vacuum hose has been designed to minimize backache and make cleaning effortless. Disan built in vacuums are more convenient, as there are no cables to be taken out and put away. On the contrary to electric and plumbing systems, planning of a Disan central vacuum system is simple. In a detached house with a living space of around 200 m², approximately 28 meters of 50mm PVC suction pipe is required. Wall inlets, including our new „IntheWall“ system, can be individually placed and installed. With just a few wall inlets, large areas can be reached and cleaned. Disan central vacuum systems are of the highest quality. Quality made in South Tyrol, Italy. Disan equippes its machines with only the best engines and filters which have been proven to stand the test of time. The quality of Disan's products makes the difference – people have been enjoying our products in a number of countries for over 30 years. 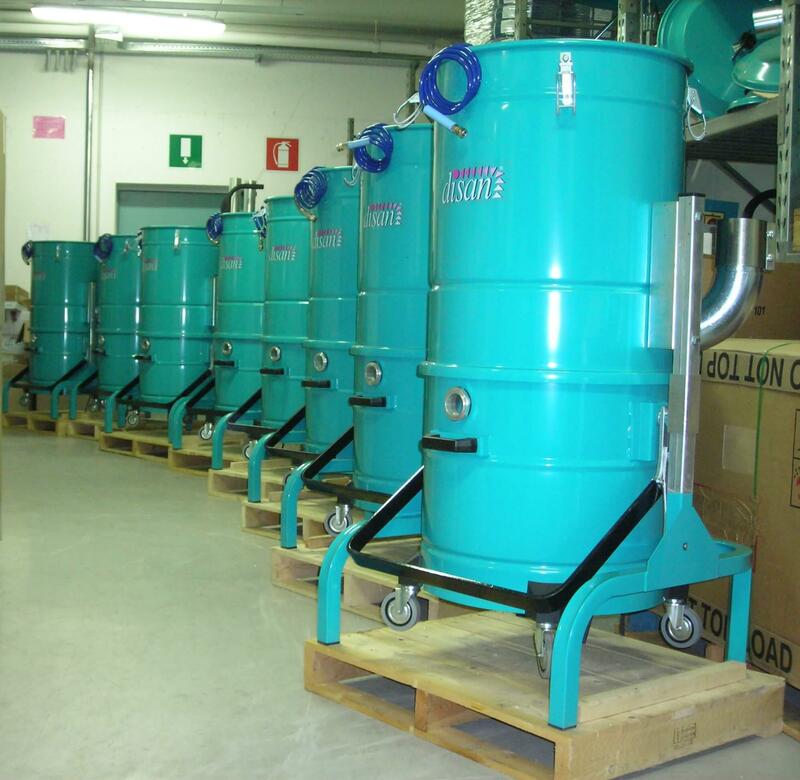 Having a Disan central vacuum system will undoubtedly increase the value of your property. Your house or apartment will be considered to be technologically state-of-the-art and of the highest standards in terms of ecology and sustainability. Selling or renting your house or apartment will prove to be more profitable with a whole house vacuum. Disan central vacuum systems are extremely durable thanks to their extremely stable and high quality construction. Customers that purchased our system over 30 years ago confirm that the initial price they paid was recouped in just a few years. It's an easy calculation to make – just imagine not having to buy any more vacuum cleaners for the next 30 years!